At St. Peter’s Catholic Primary School, we believe that effective assessment provides information to improve teaching and learning. We give children regular feedback on their learning so that they understand what it is that they have achieved and what they need to do better. This allows us to base our lesson plans on a detailed knowledge of each pupil. 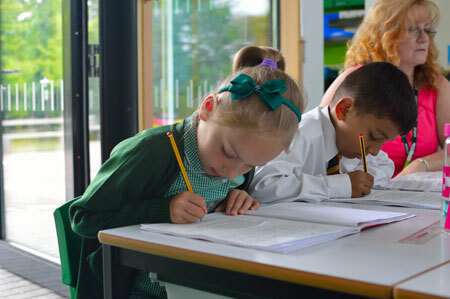 We give parents regular written and verbal reports on their child’s progress so that teachers, children and parents are all working together to raise standards for all our children. We believe that assessment is an integral part of the feedback loops which support both teachers and pupils in identifying next steps in learning. This may take the form of a teacher’s informal assessment of children’s understanding of a topic, use of questioning, informal tests or quizzes, and specific unaided activities. These activities support the wider aims of the school’s assessment and feedback policy to ensure that both teachers and pupils are aware of how learning can be moved on. Marking of pupils’ work provides opportunities for both pupils and teachers. Our policy aims to ensure that marking is not burdensome for teachers, while also making the most of opportunities for assessment. One of the primary goals of marking is to provide feedback to the teacher on pupils’ success and progress to inform future planning. This may not lead to a significant volume of evidence in pupils’ books. Where it is appropriate, teachers will provide written feedback to pupils, in an age-appropriate form, that informs pupils of their progress, and identifies for them how they can make further progress in their knowledge and understanding of the work at hand. Assessment of learning is more associated with judgements based on grades and ranks and with public accountability. % of pupils achieving a “Good Level of Development”. Phonics Screening Test at the end of Year 1. % of pupils achieving the required mark in the screening check. % of pupils achieving expected level in Reading, Writing, Maths, Spelling, Punctuation and Grammar and % of pupils achieving greater depth in these areas. % of pupils achieving expected standard in Reading, Writing, Maths, Spelling, Punctuation and Grammar and % of pupils achieving greater depth in writing.